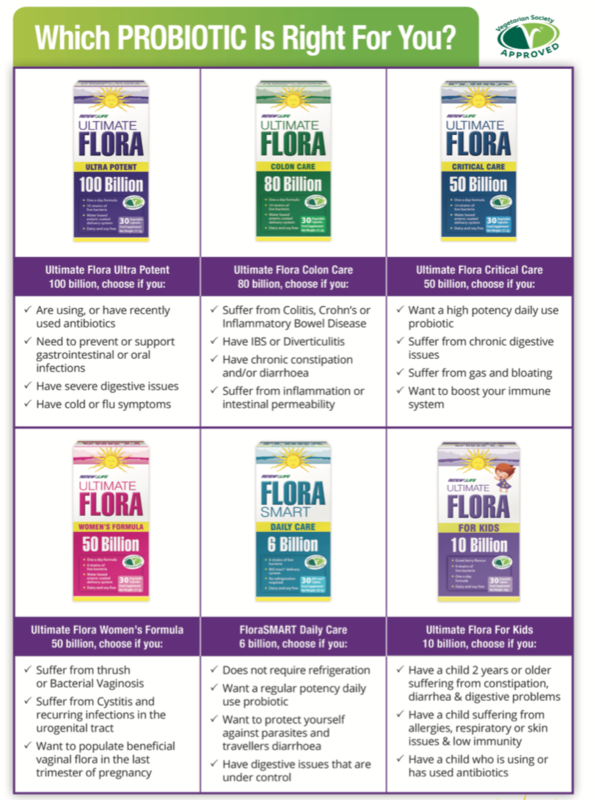 Ultimate Flora Colon Care is an 80 billion live bacteria, 10 strain probiotic formula designed for people suffering from chronic intestinal ailments in both the small and large intestine, such as Irritable Bowel syndrome, Colitis, Crohn’s and abdominal discomfort as well as those who suffer from chronic constipation and/or diarrhoea. 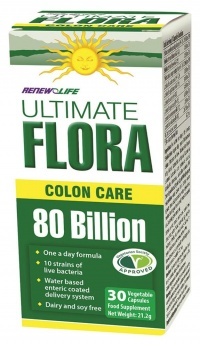 Ultimate Flora Colon Care contains therapeutic levels of both Lactobacilli and Bifidobacteria. Each capsule provides 48 billion active cultures of Bifidobacteria and 32 billion active cultures of Lactobacilli and offers complete support to the entire digestive tract, with a strong focus on the colon. Ingredients: Live bacteria consisting of the following: (Bifidobacterium longum subsp. longum, Bifidobacterium bifidum, Bifidobacterium breve, Bifidobacterium longum subsp. infantis, Lactobacillus acidophilus, Lactobacillus plantarum, Lactobacillus casei, Lactobacillus paracasei, Lactobacillus rhamnosus, Lactobacillus salivarius), FOS (fructooligosaccharides), Vegetable Capsule Shell: (hydroxypropyl methylcellulose, water), Aqueous Enteric Coating: (sodium alginate, stearic acid, hypromellose, water, ethylcellulose, medium chain triglycerides, oleic acid), Antioxidant: ascorbic acid, Anti-caking Agent: stearic acid.